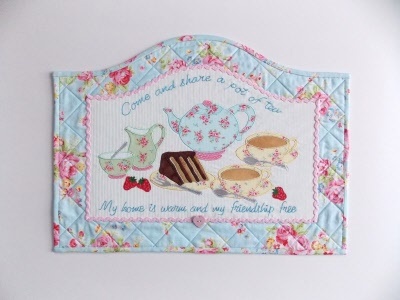 This dear little wallhanging designed by Gail Penberthy has the lovely embroidered phrase 'Come and share a pot of tea my home is warm and my friendship free'. My sentiments exactely! Using the fused applique technique, the wallhanging measures approximately 17 1/2 x 13 inches.